Despite having achieved his aim of securing a record deal it would be a further two years before Dekker would see his first record released. 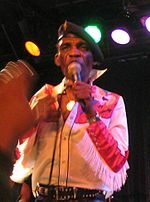 Desmond Dekker (16 July 1941 – 25 May 2006) was a Jamaican ska rocksteady and reggae singer-songwriter and musician. Other hits include "007 (Shanty Town)" (1967) "It Mek" (1969) and "You Can Get It If You Really Want" (1970). Together with his backing group The Aces (consisting of Wilson James and Easton Barrington Howard) he had one of the earliest international reggae hits with "Israelites".